This weekend I made one of our favorite appetizers for a party with our cousins. It had been years since I have dusted off this Hanky Panky Recipe, and I had forgotten just how easy it is to make them and what a crowd pleaser they are. 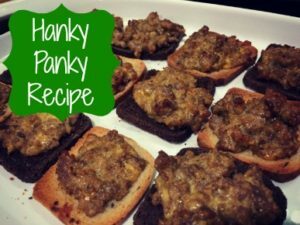 Hanky Pankies are a simple mix of ground beef, sausage and processed cheese atop a small piece of toasted bread. This recipe can be prepped in advance, and if you make a large batch you can freeze some for future parties. I always bake these, but I have also been to parties where the meat and cheese mixture is served from a slow cooker with toasted bread so people can construct their own snack. Either way you make it this Hanky Panky Recipe is delicious! In a large pot or deep skillet brown the sausage and beef over med-high heat. Once the meat is cooked through drain the grease out of the mix. Add cubes of cheese and stir until well blended. I mix the cheese in slowly until the mix is the right consistency and the cheese is all melted. I do not like to overdo it on the cheese, but some people like a lot of cheese, so it is a matter of taste! 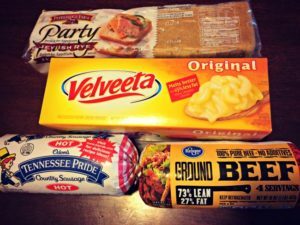 Once all the ingredients are blended put a spoonful of the mixture on each slice of bread and place them on a cookie sheet. Once the tray is full bake at 375° for about 10 minutes. I like the mixture to be a little crispy on top and the bread to be toasted, but you can also serve them when they are just warmed through. Keep an eye on them and remove from oven when they have reached the crispiness level that you want! What is your favorite appetizer for a party? For more great Appetizers visit my RECIPE archives!